Piggy French says her selection for Great Britain's World Championship eventing squad has left her in shock. The 29-year-old, who grew up in Norfolk, won a European silver medal on her GB debut last year. But she told BBC Radio Norfolk: "I'm still in quite a bit of shock but it's very exciting. Every event rider wants to ride for their country. "But to be called up for the World Championships is a complete dream come true," she added. French is joined in the team by 49-year-old veteran Mary King, a rider French says she followed around with a camera at events when she was a young "eventing geek". 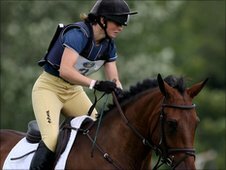 And with former world number one Pippa Funnell also in the squad, French says she will be surrounded by her childhood heroes. "It's still surreal for me to think that I'm selected to go to the World Championships as one of six when the majority of the team are people I've idolised and looked up to," she said. "Throughout my childhood I've looked up to them, wanted to compete against them and with them, so this is an unreal situation for me." After her European horse Some Day Soon suffered injury, Jakata took the position of lead horse at her Leicestershire stables. And French says she doubted whether she would be selected without a proven winner. "It was very disappointing at the beginning of the year with my top horses having injuries so I didn't think I really had a chance," she said. "But Jakata has pulled through and performed very well and the selectors have given us a shout and I'm just looking forward to the whole experience."